Field stripping is the term for disassembling a gun into its major components or assemblies. You don't completely disassemble it, but you break it down enough that you can clean and lubricate it. As the term suggests, this is something you might do in the field while further disassembly requiring special tools would be done back at the armory or shop. 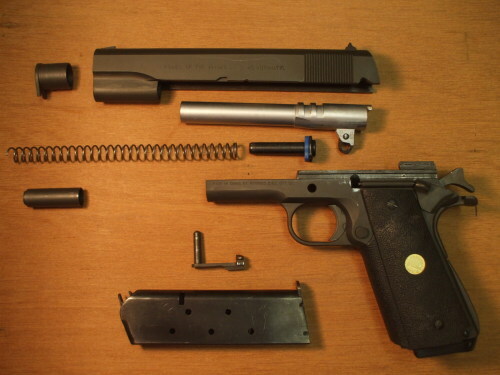 Let's see how to field strip the M1911 pistol. 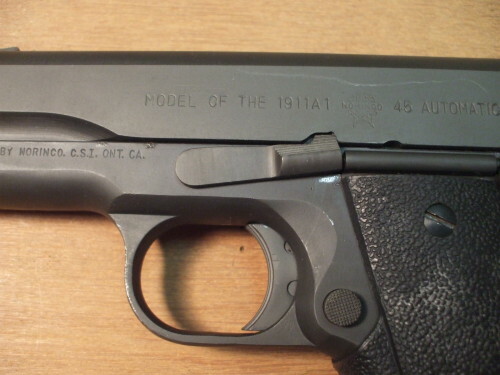 The M1911 pistol has been in service for over a century. 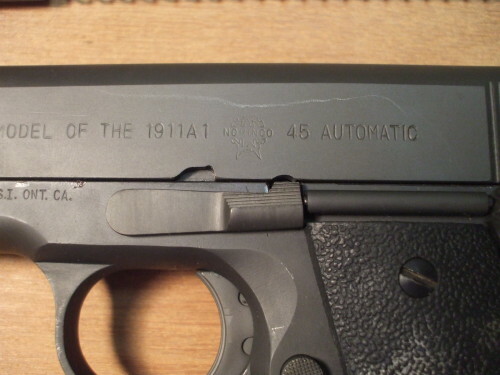 It was the standard-issue side arm for U.S. armed forces from 1911 to 1985 and is still carried by some units within the U.S. Army Special Forces, the U.S. Navy, and the U.S. Marine Corps. Its design makes it easy to field strip it to its major components for cleaning. 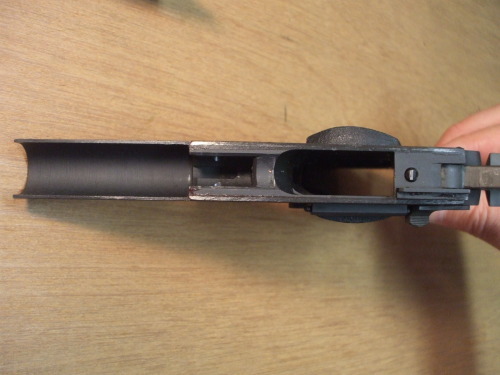 Remove the magazine and verify that it's unloaded; remove the recoil spring; remove the slide release level and the slide; then lift the barrel out of the slide. Experience in the First World War led to some very minor changes. 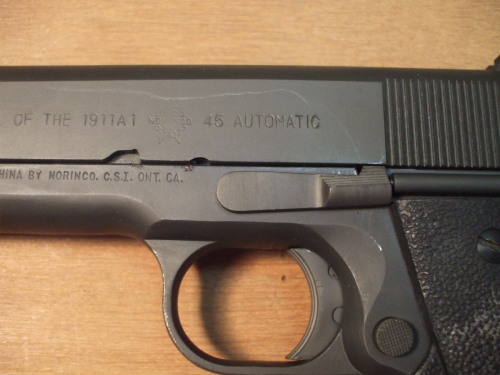 The new version, officially the M1911A1, has a slightly shorter trigger, an arched mainspring housing, a longer grip safety spur, and simplified grip checkering. The arched mainspring housing is probably the most obvious visual difference. 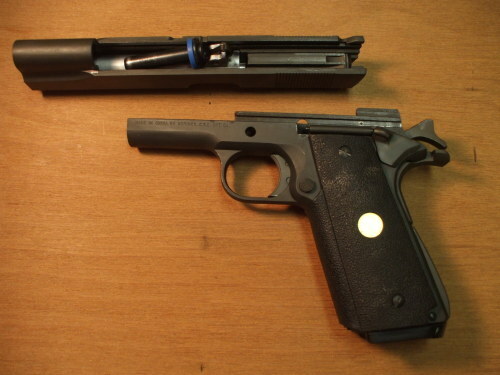 The trigger and safety spur length differences are fairly obvious if you are comparing an M1911 and an M1911A1 side by side, but they are not obvious just looking at one in isolation. 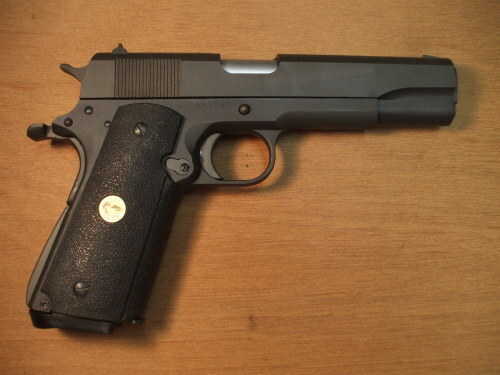 See the page on the history, use, and development of the M1911 for further details on its design. Let's break this down into its major assemblies. Wear safety glasses while doing this, as some parts are under strong spring pressure and may release when you aren't expecting it. Start, of course, with an empty pistol! Remove the magazine and set it aside. Then pull the slide back and lock it open with the slide release so you can carefully examine the chamber. Make absolutely certain that the weapon is unloaded. We're looking down into the chamber. Visually inspect it to verify that it is empty. The slide release will be holding the slide back. Pull back on the slide, press the slide release down, and slowly move the slide fully forward. You could simply release the slide and let it slam forward, but some recommend against this. Why not just close it slowly since you're holding the slide anyway? 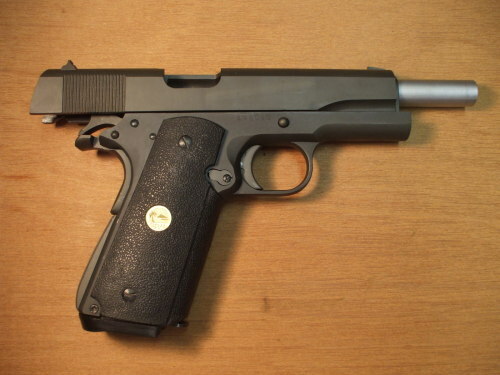 Notice the checkered button below the barrel. 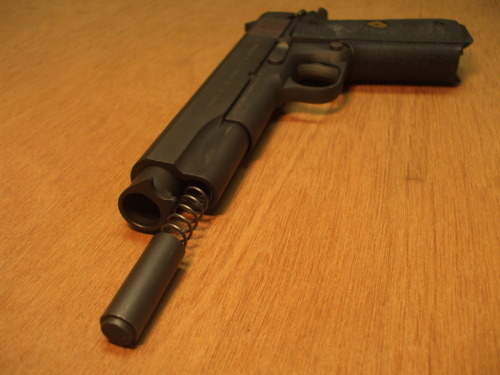 This is the recoil spring plug. 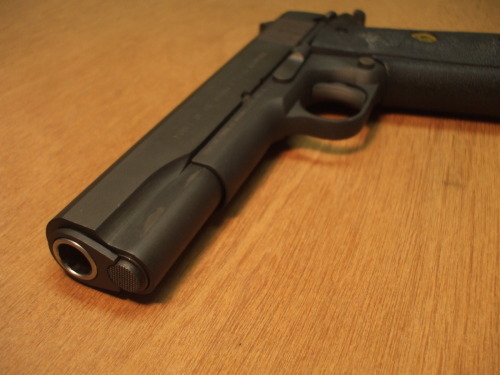 Hold the gun in one hand, pressing the recoil spring plug in with the thumb of that hand. At the same time, use your other hand to rotate the barrel bushing counter-clockwise. Here we see the bushing just starting to rotate. Be careful while doing this as the plug is under strong pressure from the recoil spring. The bushing will release from the slide when it has rotated about 90°. 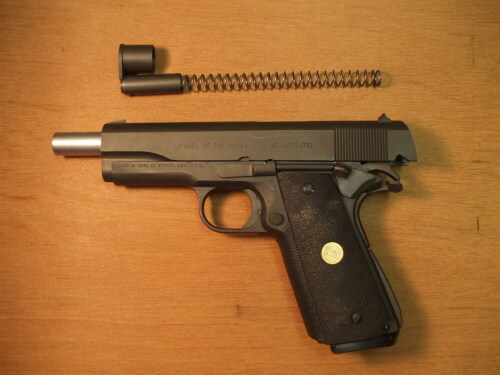 Remove the recoil spring, the recoil spring plug, and the barrel bushing. Move the slide toward the rear so the small semi-circular notch is aligned with the end of the slide release lever. There are two notches along the bottom left edge of the slide. 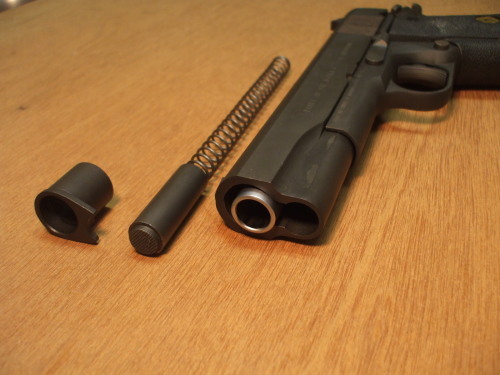 The larger one is what normally engages the slide release to lock the slide back on an empty magazine. For disassembly, we instead use the smaller semi-circular notch, as seen at left here. The round rod on which the slide release lever rotates extends through the frame and protrudes very slightly on the right side of the frame. Press on the end of that rod, like a small rounded button, to start the slide release moving out of the left side of the frame. Completely remove the slide release lever, then move the slide fully forward off the frame. Here we are looking down into the stripped frame. 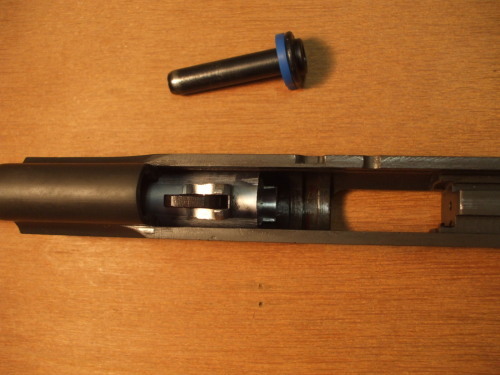 We had inverted the gun while pulling the slide forward and off of the frame, so the recoil spring guide rod and barrel stayed down in the slide. Lift the recoil spring guide out of the slide. This one has a blue rubber buffer on it. 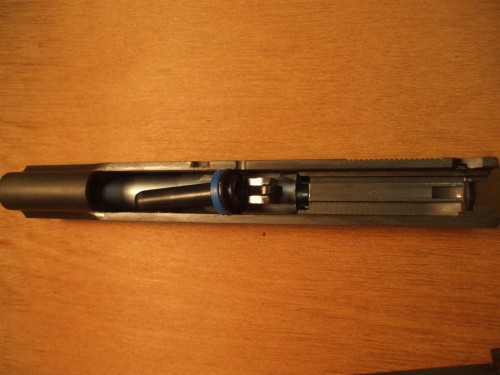 Rotate the barrel link forward so the barrel can be slid forward and out of the slide. The barrel link is the small black piece we see on top of the white barrel. 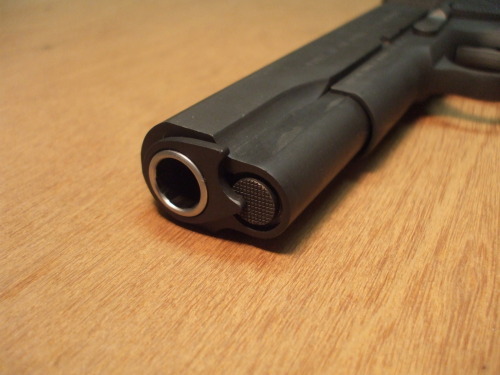 You will have to lift the barrel slightly so its lugs are disengaged from the slide. 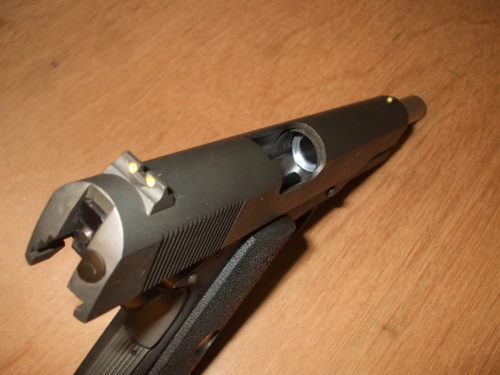 The M1911 pistol is now fully field stripped for cleaning.